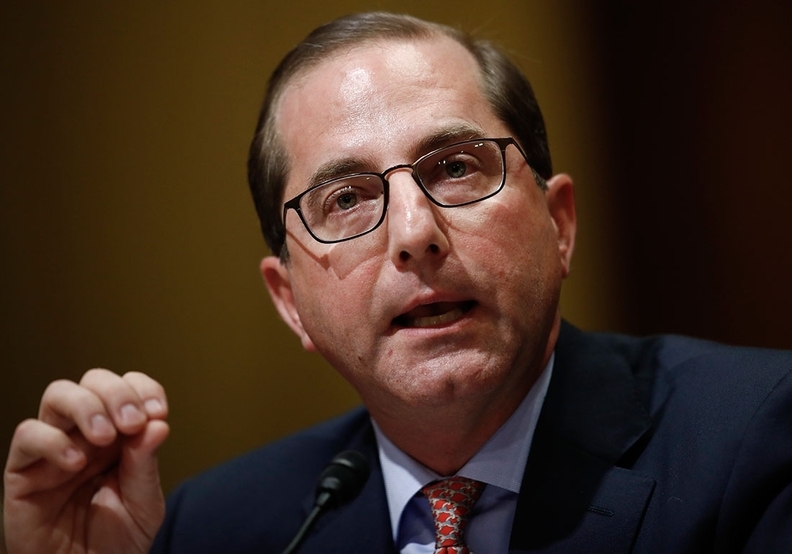 HHS Secretary Alex Azar on Thursday doubled down on promises to overhaul the Medicare billing structures to drive down government costs and vowed to put out new guidance for providers on the anti-kickback laws and HIPAA. HHS will write new guidance for laws that "stand in the way of healthcare providers" and hold back the healthcare system's transition to value-based care, Azar told a conservative audience at the Heritage Foundation. He also highlighted the CMS' new request for information on the Stark law and noted that additional requests are coming to prepare the administration as it overhauls anti-kickback and HIPAA rules. "When there's a place that our healthcare system isn't meeting people's needs, the first question we ask is what might government be doing to prevent private actors from solving it?" Azar said. "As it turns out, when it comes to paying for value, government is doing a great deal to get in the way." Azar praised CMS Administrator Seema Verma's proposed rule to simplify billing codes for physician visits as part of the value-based pay transition. However, he didn't mention Wednesday's proposed outpatient pay rule from the CMS that would significantly expand the site-neutral payment policy to cover clinic visits—a move that has enraged hospitals. The secretary noted "something has to change about how these programs work." "As healthcare has grown more and more complex, the traditional model of paying doctors based on the volume of procedures they perform, as much of Medicare does, has made less and less sense," Azar said. The secretary also promised to use regulation to take aim at the enhanced privacy law around substance addiction treatment, called 42 CFR Part 2, which the House of Representatives recently rolled back as part of its opioids package. The bill doesn't have a clear path through the Senate. The provider community has largely coalesced around repealing the extra law, which prevents hospitals or physicians from sharing a patient's medical record of addiction or addiction treatment with one another. Azar said HIPAA and the enhanced privacy around addiction can impede coordinated efforts against the opioid epidemic. On the individual market, Azar blasted Obamacare's price controls, particularly the age rating band that requires insurers to charge younger enrollees at least one-third of what they charge older people for the premiums. The secretary blamed this provision, one of the explicit targets in the congressional GOP's efforts to repeal and replace Obamacare, for keeping younger people out of the market. "The only factor keeping the individual market alive is the tens of billions of dollars of subsidies supplied directly to insurers each year," Azar said, touting President Donald Trump's budget proposal to revamp the Affordable Care Act's subsidy structure as state block grants. Azar also focused on the administration's push for work requirements in Medicaid expansion states as a key way to revamp the program to "avoid work disincentives and income cliffs." While he referenced the Kentucky lawsuit in which a federal district judge blocked the state's implementation of work requirements for now, Azar said the administration would navigate the legal challenges to push forward with the policy. "We are undeterred and fully committed to work requirements and community participation," he said. "We will continue to litigate, and take any learnings from that piece of litigation—with which we disagree." While decrying the ACA's high federal match for the expansion population — 90% instead of the varying state match for the traditional population— he promised the administration would continue backing congressional action "to undo those perverse incentives." Azar also touched on the ongoing criticisms that the administration's blueprint to lower drug prices doesn't go far enough. This week, Capitol Hill Democrats again publicly urged the Trump administration to push for direct Medicare negotiation with drug companies. But Azar said the criticism comes from lack of understanding of the drug industry's complexity and touted his own experience and that of his team who have also come from the private sector, as guiding the policy. "My pharma experience showed me where the money is," the secretary said. "Some people who don't understand complexity of the system were wondering: where's the big move? The folks who actually know the finances of drug companies are like, 'Oh no, he knows where the money is. All these 52 things are targeted approaches that get at all the approaches and levers.'" He specifically mentioned Dan Best, his senior adviser for drug pricing reform, who comes from a pharmacy benefit manager (PBM) background with a major Medicare Part D plan, for his "tremendous insight on how the plans work." PBMs are increasingly a target in the administration's approach to drug prices.